The LIINES is happy to announce that our recent paper entitled: “Demand Side Management in Power Grid Enterprise Control: A Comparison of Industrial & Social Welfare Approaches”, has been accepted to the Applied Energy Journal. This study comes as a result of collaboration between three universities; MIT, Masdar Institute, and Dartmouth. The work is authored by Bo Jiang (MIT), Aramazd Muzhikyan (Masdar Institute), Prof. Amro M. Farid (Dartmouth) and Prof. Kamal Youcef-Toumi (MIT). Demand response is an integral part of a reliable and cost-effective power grid. As wind and solar energy become two important power generation sources that reduce CO2 emissions and ensure domestic energy security, their intermittent and uncertain nature poses operational challenges on the electrical grid’s reliability. Instead of relying solely on dispatchable generation, power grid operators, called ISOs, are adopting Demand Response (DR) programs to allow customers to adjust electricity consumption in response to market signals. These DR programs are an efficient way to introduce dispatchable demand side resources that mitigate the variable effects of renewable energy, enhance power grid reliability and reduce electricity costs. Fortunately, the U.S. Supreme Court’s recent ruling Federal Energy Regulatory Commission vs. Electric Power Supply Association, has upheld the implementation of Demand Response allowing its role to mature in the coming years. Despite the recognized importance and potential of DR, the academic and industrial literature have taken divergent approaches to its implementation. The popular approach in the scientific literature uses the concept of “Transactive Energy” which works much like a stock market of energy; where customers provide bids for a certain quantity of electricity that they wish to consume. 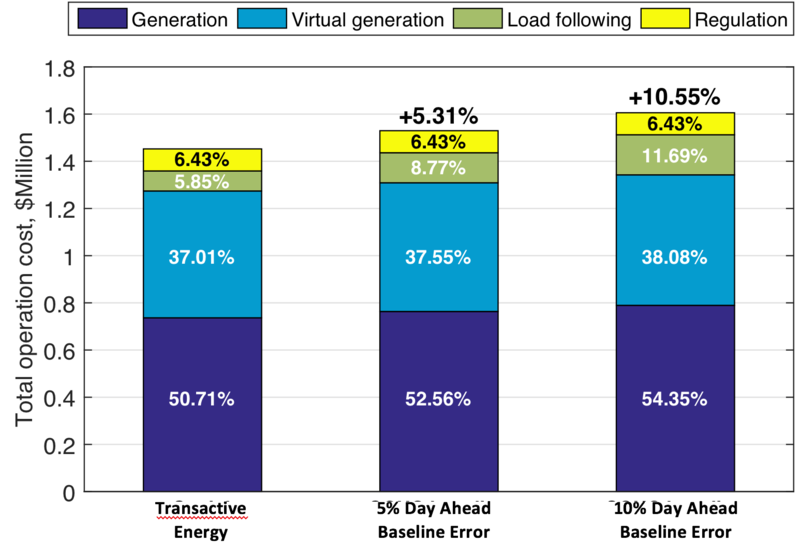 Meanwhile industrial implementations (such as those described by FERC order 745) compensate customers according to their load reduction from a predefined electricity consumption baseline that would have occurred without DR. Such a counter-factual baseline may be erroneous. At the LIINES, we have rigorously compared the two approaches. Our previous journal paper published at Applied Energy “Demand side management in a day-ahead wholesale market: A comparison of industrial & social welfare approaches” conducted the comparison in a day-ahead wholesale market context. It showed, both analytically and numerically, that the use of power consumption baselines in demand response introduces power system imbalances and costlier dispatch. Our recent paper now expands the analysis from a single day-ahead electricity market to the multiple layers of wholesale markets found in many regions of the North American power grid. This holistic analysis includes the day-ahead, real-time, and ancillary service markets. The integration of these multiple layers of power system operations captures the coupling between them and reveals the the impacts of DR implementation over the course of a full-day with a granularity of tens of seconds. The paper quantifies both the technical and economic impacts of industrial baseline errors in the day-ahead and real-time markets, namely their impacts on power system operating reserve requirements, operating costs and market prices. The paper concludes that the presence of demand baseline errors – present only in the industrial implementaiton – leads to a cascade of additional system imbalances and costs as compared to the Transactive Energy model. A baseline error introduced in the day-ahead market will increase costs not just in the day-ahead market, but will also introduce a greater net load error residual in the real-time market causing additional costs and imbalances. These imbalances if left unmitigated degrade system reliability or otherwise require costly regulating reserves to achieve the same reliability. An additional baseline error introduced in the real-time market further compounds this cascading effect with additional costs in the real-time market, amplified downstream imbalances, and further regulation capacity for its mitigation. Based on these results, the potential for baseline inflation should be given attention by federal energy policy-makers. The effects of industrial baseline errors can be mitigated with effective policy. As a first solution, ISOs could calculate demand response baselines using the same methods of load prediction normally used in energy markets. Such an approach leaves less potential for baseline manipulation. A more comprehensive solution to this problem will be the upcoming trend of transactive energy and would eliminate the concept of baselines and their associated uncertainties entirely. We are happy to announce that our recent paper entitled: “Relative Merits of Load Following Reserves & Energy Storage Market Integration Towards Power System Imbalances”, has been published in the International Journal of Electrical Power & Energy Systems (IJEPES). This study comes as a result of collaboration between three universities; Masdar Institute, Dartmouth, and MIT. The work is authored by Aramazd Muzhikyan (Masdar Institute), Prof. Amro M. Farid (Dartmouth) and Prof. Kamal Youcef-Toumi (MIT). The existing energy storage resource (ESR) studies bound their discussion to a single timescale of power system operations, such as day-ahead scheduling or real-time balancing. As a result, these studies are only able to capture the impact of the ESR integration on the associated timescale, while any effects that may span across adjacent timescales are omitted. Recently, power grid enterprise control has been developed that integrates different timescales of balancing operations into a multi-layer control hierarchy. 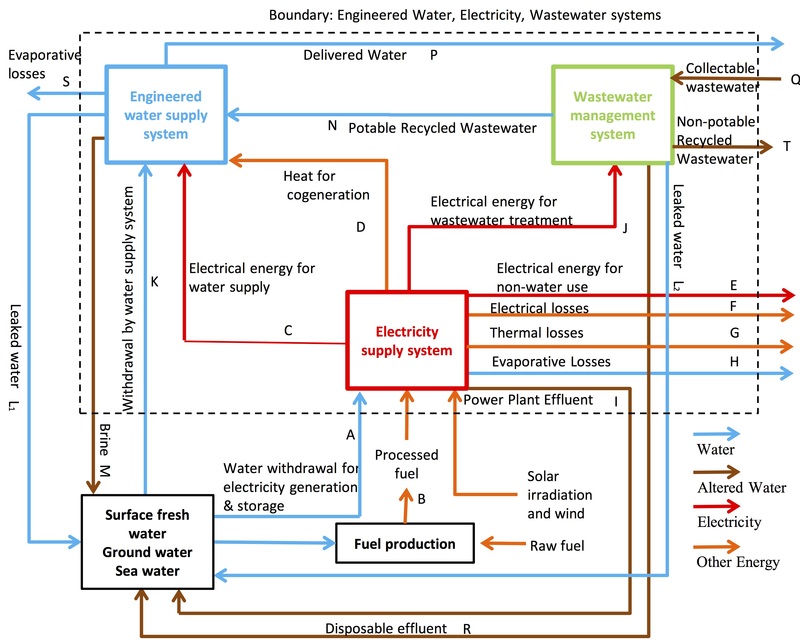 The benefits of such holistic power system modeling have been demonstrated for studies on renewable energy integration, the determination of the power system imbalances and the assessment of reserve requirements. This paper integrates ESRs into the power system enterprise control for the first time. While the ESR integration is expected to mainly affect its associated timescale, such methodology also allows capturing the potential impact on adjacent timescales. If such coupling of timescales exists, it can be exploited to reduce the system resource requirements. This methodology is also used to demonstrate the differences in imbalance mitigation performance of ESRs and load following reserves. While both these resources can be used for balancing the system, the enterprise control methodology unveils their differences and relative merits for different balancing scenarios. The notion of ‘‘utilization efficiency’’ of a given resource is introduced here which is defined as the amount of that resource required to mitigate 1MW of imbalance. A novel ESR scheduling method has also been developed in this paper that beneficially exploits the coupling between different timescales. Since the day-ahead market has hourly time step, the obtained generation schedule has a stair-like profile with constant values for each hourly interval. However, such stair-like profile does not capture the intra-hour variations of the demand, leading to higher load following reserve requirement. Taking advantage of the timescale coupling, a sub-hourly ESR profile is designed based on the day-ahead market output that, in addition to the traditional benefits of shaving the peak load and reducing the operating cost, also simultaneously reduces the load following reserves requirement. The newly designed ESR schedule is based on piecewise linear harmonic functions and resembles the smooth demand profile within hourly intervals. The results show that the ESR and the load following reserves have different performances and are better suited for applications in different circumstances. 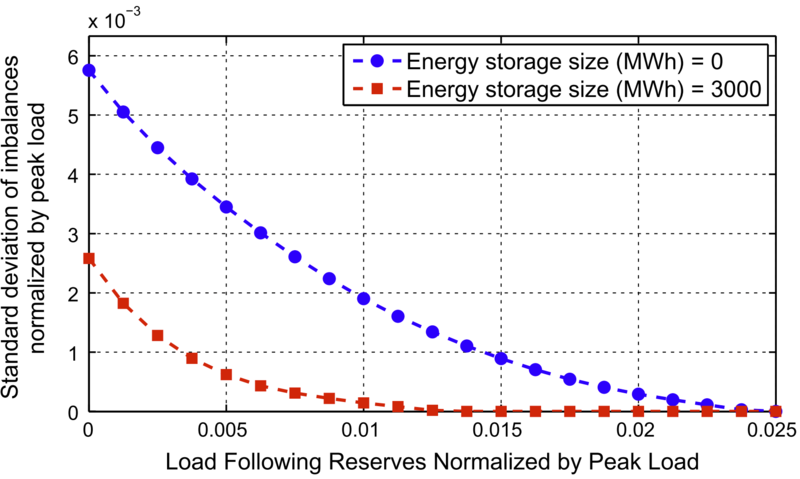 While the utilization efficiency is nearly constant for the load following reserves, the performance of the ESR significantly depends on the temporal characteristics, namely the net load variability and the day-ahead market time step. Higher variability and smaller day-ahead market time step result in better ESR utilization efficiency. 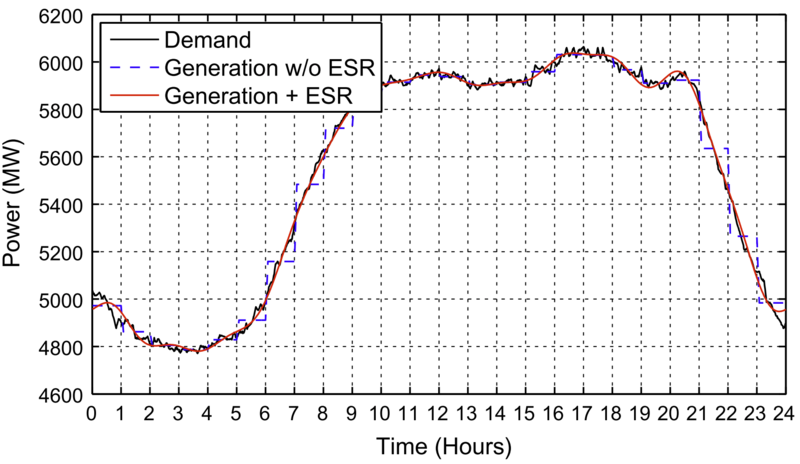 The results also show that the generation schedule of the system without ESR has a stair-like form, while the total generation+ESR schedule of the system with ESR integration has a much smoother form and more closely resembles the actual demand profile. This difference defines the actual load following reserve requirement for each system. 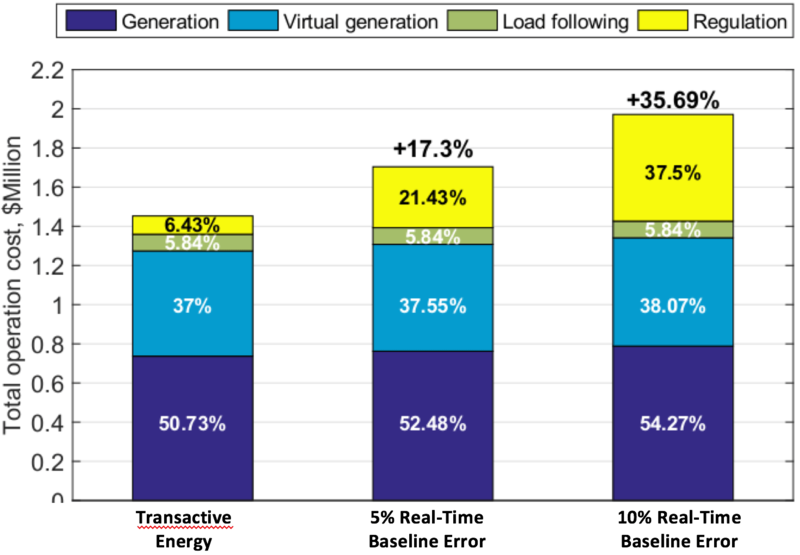 The results show that the load following reserve requirement of the system with ESR integration is significantly lower compared to the traditional system without ESR. The difference of load following reserve requirements for systems without and with ESR. The LIINES is happy to announce that our recent paper entitled: “Symmetrica: Test Case for Tansportation Electrification Research” has been published in the journal Infrastructure Complexity. Written by Prof. Amro M. Farid, this paper presents a test case for electric vehicle integration studies. Electrified transportation has emerged in recent years as a means to reduce CO2 emissions and support energy efficiency. For this trend to succeed in the long term, electric vehicles must be integrated into the infrastructure systems that support them. Electric vehicles couple two such large systems; the transportation system and the electric power system into a nexus. Electric vehicle integration, much like solar PV and wind integration years ago, has been fairly confined to small fleets of tens of vehicles. Such small pilot projects do not present a significant technical challenge. Their large scale adoption, however, must be carefully studied to avoid degrading overall infrastructure performance. Transportation electrification test cases serve to study infrastructure behavior well before reaching a full deployment of electric vehicles. Such a test case would resemble those often used in power systems engineering to serve methodological development in the design, planning, and operation of such systems. The arguments for a test case to study the transportation electricity nexus are five-fold. First, a standardized test case is required to test, and compare analytical methods. In power systems, test cases served an essential role in the maturation of power flow analysis, stability studies, and contingency analysis. The transportation-electricity nexus will ultimately also require similar assessments. Secondly, using real data from critical infrastructure may be imprudent. For example, real data may reveal weak points in a power system which may be exploited by unauthorized personnel. Thirdly, a test case serves to support fundamental understanding by broadening intuition development. 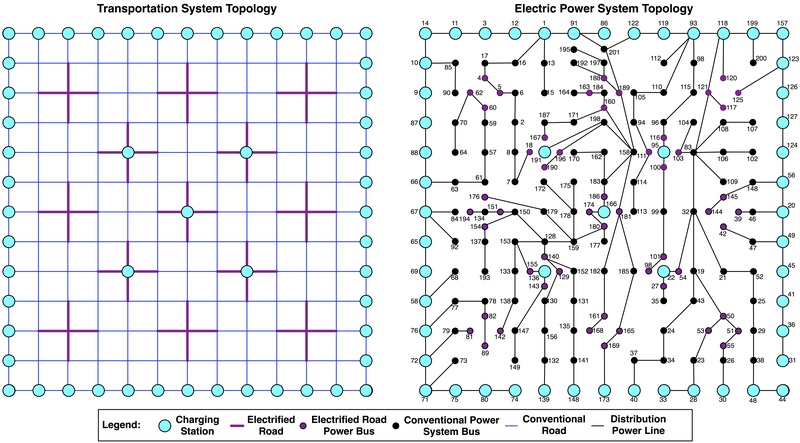 For the transportation-electricity nexus, understanding the effect of increasingly interdependent dynamics, will result in new requirements for optimization and control for its planning and operation. Naturally, this new found intuition serves the fourth reason of methodological development. A test case serves facilitates the design, planning, and operation of the system before it is built. Unexpected behaviors may be identified in an early stage and can subsequently be avoided or mitigated. Finally, the privacy of personal data is protected through using a test case. Transportation simulation requires microscopic data (tracking each vehicle through a full day’s events), which raises grave privacy and ethical concerns if real data is used. To address these needs, the proposed test case includes three structural descriptions: a transportation system topology, an electric power topology, and a charging system topology. Additional data includes transportation demand and charging demand. The test case consists of a number of desirable characteristics, including completeness, functional heterogeneity, moderate size, regular topology, regular demand data, realism, and objectivity. The figure below shows the three topologies; a fully detailed description test casenamed ‘Symmetrica’ is available in the paper. The transportation electrification test case can potentially be used for research within planning and operation management applications. A recent study (Al Junaibi et al. 2013) showed that the planning of the charging system as the couple of two infrastructure systems highly impacts the overall performance of the transportation electrification nexus. Matching the spatial layout of charging infrastructure to the demand for electrified transportation is key a infrastructure developent challenge. Furthermore, investment costs to upgrade power lines and transformers must be matched to the expected adoption of electric vehicles, providing an interesting starting point for return-on-investment and operations research methods. Using operation management applications such as charging station queue management or vehicle-2-grid stabilization could optimize the integration of electric vehicles within the nexus. Opportunities such as these present rich applications areas which have the potential to significant reduce the extra expenditure in infrastructure investments. In depth materials on LIINES electrified transportation systems research can be found on the LIINES websitte. We are happy to announce that our recent paper entitled: “An A Priori Analytical Method for the Determination of Operating Reserve Requirements”, has been accepted at the International Journal of Electrical Power & Energy Systems (IJEPES). This study comes as a result of collaboration between three universities; Masdar Institute, Dartmouth, and MIT. The work is authored by Aramazd Muzhikyan (Masdar Institute), Prof. Amro M. Farid (Dartmouth) and Prof. Kamal Youcef-Toumi (MIT). As renewable energy becomes an ever present resource in power systems, so called “operating reserves” become increasingly important instruments for reliable power grid operations. One can think of operating reserves as additional generation capacity scheduled to compensate for real-time power supply and demand imbalances due to the existing uncertainties in forecasting not just demand but also renewable energy. On the one hand, the amount of operating reserves should be sufficient to successfully mitigate the real-time imbalances and maintain power system reliable operations. On the other hand, operating reserves are a costly commodity and they should not exceed the minimum required amount to avoid unnecessary expense. This makes accurate assessment of the operating reserve requirements vital for reliable, economic, and environmentally friendly operation of the power grid. Currently, the necessary amount of the operating reserves is assessed based upon the power system operator experiences and the assumption that the circumstances of power system operations remain relatively unchanged. However, growing integration of renewable energy sources (RES), implementation of demand side management and transportation electrification alter the overall structure and the dynamics of the power grid. High penetration of RES brings new levels of variability and uncertainty to the grid which challenges the established practices of power system operations and the operating reserve requirement assessment methods. This newly published article provides closed-form analytical formulae that tells grid planners how much reserves to procure as they plan for more renewable energy without sacrificing economics or reliability. While RES integration can potentially reduce the grid’s CO2 emissions and operating costs, it also brings new challenges that power grid operators need to address in order to maintain reliable operations. Wind power, for example, is known to have high intermittency; that is, the output power of a wind turbine may vary uncontrollably in a wide range. This, combined with comparably low wind forecasting accuracy, requires careful scheduling of traditional power plants and their operating reserves. Integration of solar power, on the other hand, has its own challenges. As shown in the figure below, the net load profile (the power demand minus the solar generation) of a system with integrated solar generation has a distinctive profile. It is often called the “Duck Curve” for its resemblance to the side-profile of a duck. 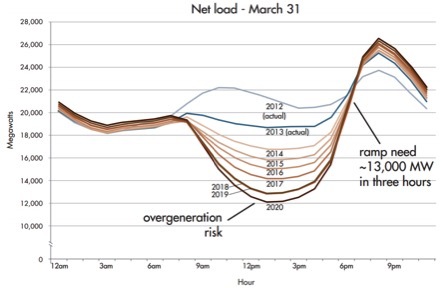 The figure presents the net load profiles of the California Independent System Operator (CAISO) for the day of March 31 for forecasted from 2014 to 2020. The “belly” of the curve corresponds to the day time when the solar generation is at its maximum and is expected to grow with new solar power installations. With an estimated demand of 22,000MW in the year 2020, the solar generation accounts for 10,000MW or 45%; leaving only 12,000MW for the traditional generation. This situation increases the risk of overgeneration and solar generation curtailment. Another challenge is the steep jump of the net load around 6pm as solar generation wanes with the sunset and demand picks up for evening home life. Such severe variations of the net load require more careful consideration of the ramping capabilities of the scheduled generation. This publication has developed analytical formulae for calculation of the requirements for each type of operating reserves; namely, load following, ramping and regulation. The derivations show that the operating reserve requirements are effectively defined by a set of dimensionless parameters related to the RES characteristics and the operations of the power grid. Those parameters are the penetration level, renewable energy capacity factor, variability, day-ahead and short-term forecast errors of the integrated RES, and the power grid day-ahead scheduling and real-time balancing time steps. Such analytical expressions reveal how the requirements of each type of reserve will change when, for instance, more renewable energy is integrated, renewable energy forecasting accuracy is improved, and the day-ahead scheduling time step is reduced. This study show that higher RES variability significantly increases the requirements of all three types of reserves. Also, while the impact of the RES forecast error on the ramping reserve requirement is negligible, its impact on the load following and regulation reserve requirements can dominate that of the variability. On the other hand, reducing the day-ahead scheduling time step can mitigate the impact of the variability on the load following reserve requirement while having negligible impact on the ramping and regulation reserve requirements. Also, changing the balancing time step has no noticeable impact on the load following reserve requirement, it has opposing impacts on the ramping and regulation reserve requirements. Reducing the balancing time step reduces the regulation reserve requirement but increases the ramping reserve requirement. These formulae can be used for renewable energy integration studies, such as those conducted in NE-ISO and PJM-ISO, to assess the required amount of reserves for the planned RES installation. They can also be adapted by the state and federal standards organizations to establish reserve procurement standards that reflect the evolution of the power grid. The World Wind Energy Association (WWEA) technical committee has recently published a report entitled “Wind Energy 2050: On the shape of near 100% RE grid”, which studies the challenges of wind energy integration into the power grid and discusses some of the solutions to address these challenges. Chapters 5 and 6 of this report are based upon the work of Dr. Amro M. Farid and discuss the evolution the power grid as it accommodates increasing capacities of wind energy. Wind and solar energy have already become mainstream energy sources in some regions of the world. While the integration of wind energy has numerous benefits, it also creates new challenges for power system operations. Wind energy is inherently variable and, in order to successfully accommodate it, the power system has to undergo a dramatic change. Furthermore, and in contrast to the traditional thermal generation units, wind energy sources are non-dispatchable in the traditional sense, meaning their outputs cannot be set to the desired value. As a result, the integration of wind energy requires new approaches to power grid planning and management, including investments into improved wind forecasting techniques and reconsidering operating reserve requirements. A conventional power system consists of relatively few centralized and dispatchable generation units, and a large number of distributed and stochastic (but accurately forecastable) loads. The electricity is delivered from the centralized and predominantly thermal power plants to the distributed electrical loads. During many decades of operations, power system operators and utilities have developed improved methods for performing their tasks. Generation scheduling and dispatch, reserve management and control technologies have matured. Load forecasting accuracy has improved significantly, reducing forecast errors to as low as a few percent. Power system security and reliability standards have also evolved accordingly. Six key drivers currently govern the evolution of the grid, namely environment protection, reliability concerns, renewable energy integration, transportation electrification, consumer participation and power market deregulation. This evolution will lead to a diversification of the power grid energy portfolio to include more solar, wind, energy storage and demand-side resources. Thus, the newly emerging operation procedures will not only engage with generators but also with consumers and other ancillary units. As a result, the already existing control technologies and procedures will expand significantly in both number and type. This will challenge the basic assumptions of power system design and operations. Therefore, the question is not how to mitigate wind variability, but rather how the power grid should evolve to successfully accommodate a high penetration of wind energy. Governed by these drivers, power system generation and consumption will evolve towards more equal roles in grid operations. First, from the perspective of dispatchability, wind energy sources resemble traditional consumption in that they are non-dispatchable and forecasted. On the other hand, the introduction of demand response creates makes some portion of the energy consumption dispatchable much like traditional power generation facilities. These two trends change the balance of dispatchability and forecastability as shown in Table 1. Second, the integration of wind energy, like most renewable energy sources, changes the spatial distribution of the generation. Wind energy sources can vary from several kWs to hundreds of MWs. While larger facilities will continue to be installed centrally into the transmission system, the smaller facilities will be installed at the power grid periphery as distributed generation. (See Figure 2). This creates the potential for upstream flow in the distribution system, which was not generally allowed before, and requires the redesign of the protection system accordingly. While many power grid phenomena overlap, the literature has traditionally treated them strictly separately. The evolution of the power grid necessitates reconsidering the distinction between timescales. It also requires revisiting the distinction between the transmission and distribution systems. In advocating for power grid enterprise control, our work encourages holistic approaches that work across time scales as well as the fully supply chain of electricity including both the transmission as well as the distribution system. This work also moves away from the traditional classification of technical and economic control objectives and utilizes the concept of integrated enterprise control as a strategy for enabling holistic techno-economic performance of wind integration. As shown in Figure 3, the power system is modeled as a cyber-physical system, where the physical integration of wind energy and demand-side resources must be assessed in the context of the control, automation, and information technologies. 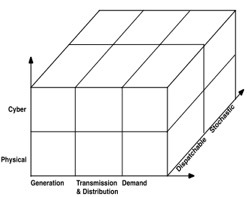 The horizontal axis represents the energy value chain from the generation to the consumption. Finally, the third axis classifies both the generation and the consumption into dispatchable as well as stochastic units. This graph represents the scope of the power system that must address a complex mix of technological, system and societal objectives. We are happy to announce that Prof. Amro M. Farid has joined the University of Massachusetts Transportation Center (UMTC) as an affiliated researcher. The announcement can be found as a blog post here. By entering the UMTC affiliated researcher network, the LIINES and UMTC will be able to more closely collaborate on interesting transportation research. Naturally, some of these areas include transportation electrification, intelligent transportation systems, and connected & automated vehicles. The University of Massachusetts Transportation Center (UMTC) is located at the University of Massachusetts – Amherst, 214 Marston Hall. The UMTC conducts research on all aspects of Transportation including Travel Behavior, Transportation Modeling, Sustainability, Freight, Transit, Intelligent Transportation Systems, Optimization, Transportation Finance and Policy, Emission Estimation and Modeling, Commercial Motor Vehicle research, Safety, Human Factors, GIS, Climate Change and Economic Development. The UMTC is funded in part by the MassDOT, New England Transportation Consortium and National UTC Consortiums. In depth materials on LIINES electrified transportation systems research can be found on the LIINES website. On May 11, 2016, Prof. Amro M. Farid gave an invited lecture at the Institute for Transportation Engineers 2016 Northeastern Annual Meeting held in Portsmouth, NH. The presentation entitled: “Intelligent Transportation-Energy Systems for Massively Electrified Transportation Infrastructure” featured many of the LIINES’ research on electrified transportation systems. The presentation advocated the concept of “Intelligent Transportation Energy Systems” which has been the subject of several recent blogposts. (See here, here, and here). Electrified modes of transportation: vehicles, buses and trains fundamentally couple the transportation and power grids. This coupling presents new challenges in the operation of each system which would not have existed if each was operated independently. At its core, the ITES requires a new transportation electrification assessment methodology that draws upon microscopic traffic simulation, power grid dynamics, and Big Data-Driven use case modeling. Such an ITES would come to include coupled operations management decisions including: vehicle dispatching, charging queue management, coordinated charging, and vehicle-to-grid ancillary services. The presentation concludes with simulation results from the first full scale electric vehicle integration study which was recently conducted for a taxi-fleet use case in Abu Dhabi. In depth materials on LIINES electrified transportation system research can be found on the LIINES website.